In a few days, Gilberto Rodríguez Orejuela, known as "The Chess Player" for his shrewdness in building Colombia's Cali cartel into the world's dominant cocaine supplier, will step off a Drug Enforcement Administration plane in Miami to face U.S. justice. Younger brother Miguel Rodríguez Orejuela, known as "El Señor," is likely to follow soon. So will begin one of the biggest drug and money-laundering cases ever prosecuted in Miami's federal courts. It is an ironic turn for the brothers, who never thought they would set foot inside a U.S. courtroom. As insurance, they allegedly financed a successful 1994 presidential campaign to keep cartel-friendly faces running Colombia's government. In the end, their efforts to avoid extradition helped make it happen. Federal law enforcement officials consider the brothers their biggest trophy in the war on drugs since Medellín cartel leader Pablo Escobar was gunned down by Colombian police in 1993. But some experts say the extradition is more of a moral victory than a practical one. "They don't get any bigger than this, but it is largely symbolic," said Adam Isacson, director of programs for the Center for International Policy in Washington. "Gilberto is no longer a player." Gilberto and Miguel Rodríguez Orejuela face an indictment that alleges four conspiracies, to import and distribute cocaine, launder money and obstruct justice through bribery and murder from 1990 through July 2002. The indictment also seeks to seize $2.1 billion in drug money and assets. Rumors of a plea bargain are rampant in Colombia. This month, Gilberto Rodríguez Orejuela , 65, told the weekly magazine Semana he had not cut a deal, but left open the possibility. "U.S. justice is practical," he said. "If we are important to them then surely there will be some kind of proposal, but the problem is we only have our liberty to give them." Law enforcement veterans of the wild cocaine-cowboy era say a U.S. trial for the brothers has been a long time coming. "Now it's payday. Let's hope so," said Joe Toft, who headed the DEA's office in Bogotá from 1988 to 1994 when he exposed the corruption, quit his post and labeled Colombia a "narcodemocracy." "It's hard to believe," said Tom Cash, who ran the DEA's Miami office during the cartel's heyday. "These people were the untouchables in Cali." Cash credited the cartel's long run to its low profile and business acumen. "It's one of those proof positives that these cocaine traffickers were far from cowboys, much more like Wall Street businessmen who used their stealth and their brains and were extremely successful for a very long time," he said. Now the Cali cartel has been replaced by smaller, more dangerous "baby cartels." Experts estimate as many as 300 mini cartels operate in Colombia. Still, the prosecution of the Cali cartel leaders carries huge political and diplomatic stakes. Colombia is the largest recipient of U.S. aid outside of the Middle East. President Clinton launched a program called Plan Colombia aimed at stemming the flow of drugs. Between 2000 and 2005, the United States will have spent nearly $4 billion, but Plan Colombia will end next year unless Congress approves additional funding. Unlike the Medellín cartel, which fought the Colombian government with murders, kidnappings and bombings, Cali was the country-club cartel. Its leaders bought the government while cloaking themselves in respectability. Gilberto Rodríguez Orejuela is a banker by trade, with a taste for soccer, Colombian poets, and friends in high places. Miguel Rodríguez Orejuela holds a law degree from a prestigious university and has been described as a Type-A workaholic. Together they built a sophisticated, $7 billion-a-year empire that by the mid-1990s supplied 80 percent of the world's cocaine, according to the DEA. They came up with creative ways of hiding cocaine in cement pillars and frozen broccoli and pioneered sophisticated methods to launder drug cash through businesses that appeared legitimate. Chief among them, a chain of discount pharmacies called Drogas la Rebaja, which the Colombian government seized. Things began to unravel in the mid-1990s. The cartel's contribution of nearly $6 million to the campaign of Colombia's newly elected president, Ernesto Samper, created an international scandal that stained Samper's presidency, convinced the United States to yank his visa, and brought international pressure that ultimately led to the brothers' high profile arrests in 1995. Gilberto Rodríguez Orejuela, captured that June, was hiding in a secret compartment in an entertainment unit in his white stucco home in the hills of Cali. He had eluded the army and police for weeks and was rumored to have been arrested after female undercover agents followed the scent of his cologne. "I'm a man of peace," he told them. "Don't kill me." Miguel Rodríguez Orejuela , 61, was nabbed in his underwear three months later, scrambling for his secret, panic room. He praised police for the quality of their intelligence, unaware his own intelligence chief had betrayed him. By that time, U.S. authorities say, the brothers were restructuring the family business, turning the day-to-day operations over to Miguel Rodríguez Orejuela 's lawyer son, William Rodríguez Abadia, 40. He is a fugitive. The U.S. government's evidence is spelled out in a 64-page affidavit included with the extradition request. The document, by Immigration and Customs Enforcement Agent Edward Kacerosky, relies on the word of the cartel's former accountant and intelligence chief, as well as seized financial ledgers, computer disks and hundreds of hours of taped conversations. "Beginning approximately four years ago," Kacerosky wrote, "I began to receive new information and evidence from a wide variety of sources and witnesses relating to the continued criminal activities of the Rodríguez-Orejuela brothers and a number of their associates." Perhaps the most damaging new witness is Fernando Flores Garmendia, known as El Gordo, who moved cocaine through Venezuela. After his extradition in 1999, Flores Garmendia provided the evidence that finally convinced a Colombian court to issue extradition orders for both brothers. The Rodríguez Orejuelas thought they were protected by a 1997 amnesty agreement with the United States. But according to Flores Garmendia and other witnesses, they continued to run the cartel from behind bars long after the agreement, making them eligible for extradition. Court documents allege that they bribed prison officials and used an elaborate system of runners, cell phones and landlines to escape detection. They also paid subsidies to the families of jailed co-conspirators to ensure their loyalty. Gilberto Rodríguez Orejuela denies it. The February 2004 indictment is an offshoot of Operation Cornerstone, an investigation that racked up more than 75 convictions during the 1990s. Among them, two former Miami federal prosecutors and a former Department of Justice lawyer who crossed the line between adviser and accessory by laundering money and buying off witnesses for the cartel. "We had two kinds of lawyers in Miami, criminal lawyers and lawyer criminals," recalled Cash, Miami's former DEA chief. Now, Operation Cornerstone is producing the government's most powerful witnesses against the brothers, including once high-ranking cartel insiders. Some cooperated because they feared for their lives. Others hope to shorten their prison sentences. With his wife and best friend missing and presumed dead and a murder contract on his head, Guillermo Pallomari González surrendered to DEA agents in August 1995. He pleaded guilty to racketeering and money laundering. He testified as a top government witness at three trials in Miami, and provided information to authorities in Colombia, Mexico and Switzerland, producing ledgers and decoding computer disks. 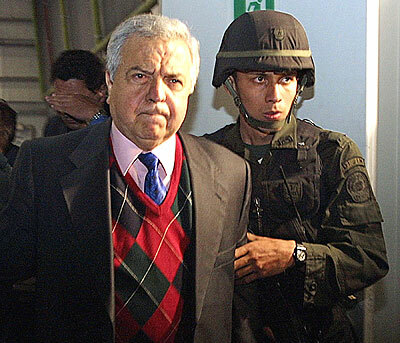 Jorge Salcedo Cabrera, the cartel's former intelligence chief, bugged the cartel's enemies, informants and government officials, but began secretly cooperating with U.S. agents in July 1995. After he led police to Miguel Rodríguez Orejuela 's hideout, he was placed under protection in the United States, eventually pleading guilty to racketeering. Julio Jo-Cipriano, a Cuban-American, was arrested by Colombian police in 1995, and served as the brothers' personal assistant in prison. He says they paid him for his silence, providing money for his family until 2002. Flores Garmendia's mother, chauffeur and bodyguard also received payments as long as he remained loyal and silent, according to the affidavit. "I can state that many of the criminal activities of the major Cali cartel leaders who were jailed in 1995 and 1996 continued from within Colombian prisons," ICE agent Kacerosky wrote. "The pattern of these activities was consistent in many respects with the pattern of prior trafficking and criminal activities of these cartel chieftains."